Antique Brass Brunton Pocket Transit Compass with Rosewood Box 4"
The Hampton Nautical Antique Brass Brunton Compass easily folds to fit in your pocket. The Brass Brunton nautical compass is 4-inches in diameter. This antique brass compass is small but heavy for its size. It is a functional compass and has a lid with a mirror inside. On the back of the solid brass Brunton compass is a Natural Sine index. 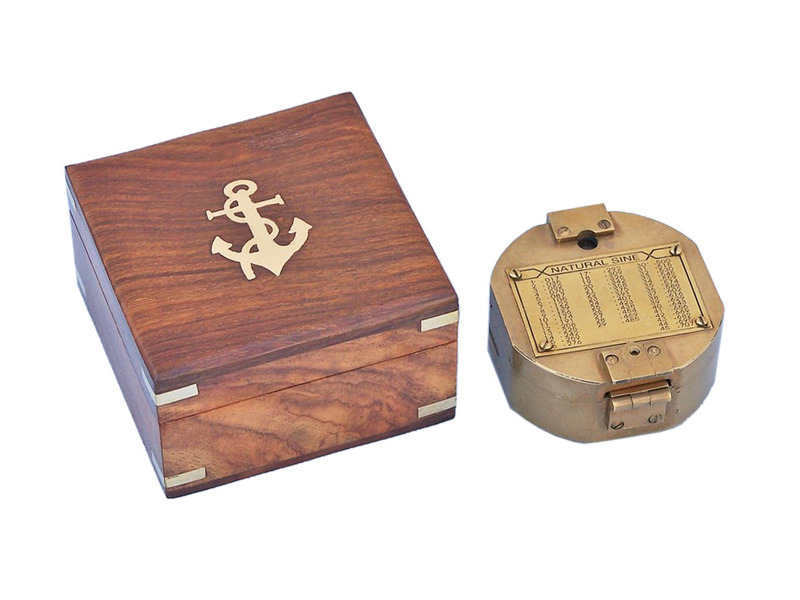 This antique brass compass comes with a solid rosewood box with the Hampton Nautical anchor with rope logo embedded into the top. The box is a smooth and polished finish wood with a blue felt on the inside to protect the compass.